Week 2 on Slimming World has been great, I've really enjoyed it. I feel like i'm 100% committed, motivated and i feel like that's showing with another 3lbs. Meaning I've lost 6lbs in 2 weeks and 1lbs away from my half stone award. It has fitted in to my life really easily and I honestly couldn't be happier with how it's all going. I even had a bit of a naughty weekend too with a fair amount of Malibu and a couple of tweet treats from this amazing goody box from Betty's Tea Room so the fact I've lost 3 is great. 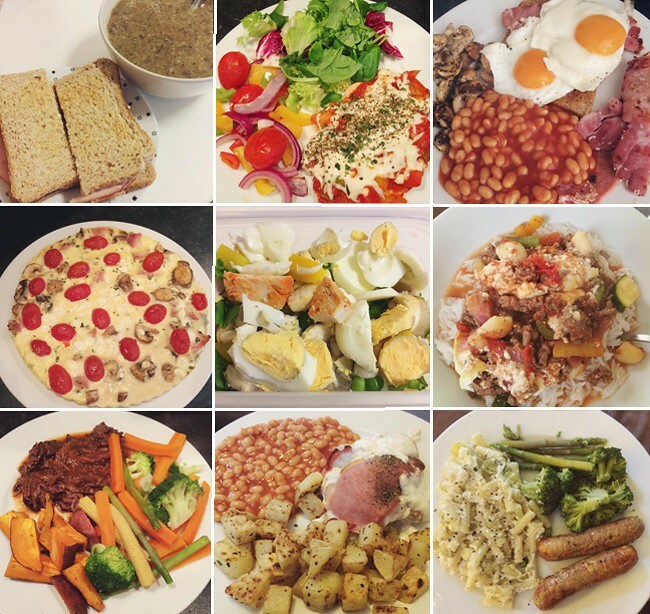 One thing love about Slimming World is the food varieties and the hundreds of recipes available online and on the app.When I first did SW i don't think the app was that good and I didn't use it but my gosh, it's great. It's so handy to use when you want to know the value of syns quickly, or recipe ideas. I was in Tesco the other day and I wanted to know how much cream cheese I could have as my HexA, and there was one that popped which i didn't know was available and meant i could have more of it because it was light. Amazing! So on to what I've been eating this week. Breakfasts have been my usual fruit and yogurt. I can't see this changing anytime soon. Although James has started making scrambled egg at work in the microwave and say it's good so i may try this one day next week with some salmon for variety. I've really experimented this week with lunches/dinners. I made a bacon and mushroom quiche to have a couple of days with some salad and it turned out ok. But someone suggested draining the bacon and mushroom next time which I think will help take a lot of the moisture out, it was nice and I would have it again. I didn't have any cheese in it either making it 100% syn free and I was able to use my HexA somewhere else. Main meals have where it's been at this week, I tried something new each day. From Mexican Cheese Bake, Pizza Topped Turkey and Marrorini Cheese. I even went to a BBQ at the weekend and had the SW burgers and sausages which are syn free. I've actually got a cooking post for the Pizza Topped Turkey going live next week. My puddings this week have been my usual Dairy Milk (120g) which is 6 syns. Favourite meal last week? This is difficult, but i'd have to go with cheese and leek maccroini cheese, although chicken with cream cheese wrapped in bacon was very close second! Cheesy week clearly! Learnt anything new? The Aldi Pulled Beef is only 1.5 syns for the whole lot! Complete last weeks aims? Yes! I added a lot more speed to my meals and made sure i drank at least 1L of water a day. Aims for this week? Just to carry on as i have been doing, nothing specific I don't think. Any new dishes to try? I want to try and make some snacks this week, I've seen a SW Scotch egg recipe which sounds right up my street. Wanting to lose? I’m being weighed 2 days earlier next week as i'm at a wedding Wednesday and weigh in the next day would mean I probably wouldn't enjoy myself as much! So I'd be happy with 1, but 2 would be awesome. Well done!! Just started SW again recently too. Been having bread as my HEXB and I currently look 5 months pregnant. I may swap to cereal and save bread for weekends like you mentioned in your previous SW post. Well done, you look amazing! Seems like you're doing great. Well done lovely! You're doing so well :) I've been doing SW for about 6 weeks now and got my 1/2 stone award on Tuesday and I'm so happy!! I also bought the Fakeaway book this week which I'm looking forward to using for meals this week.